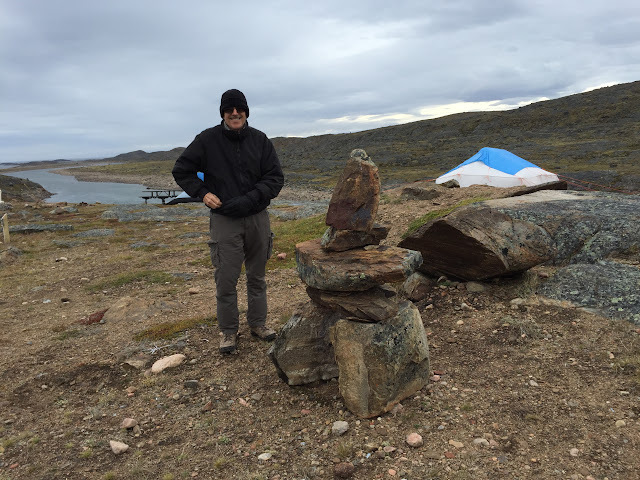 Seeking True North, Day 12: Iqaluit, NU. 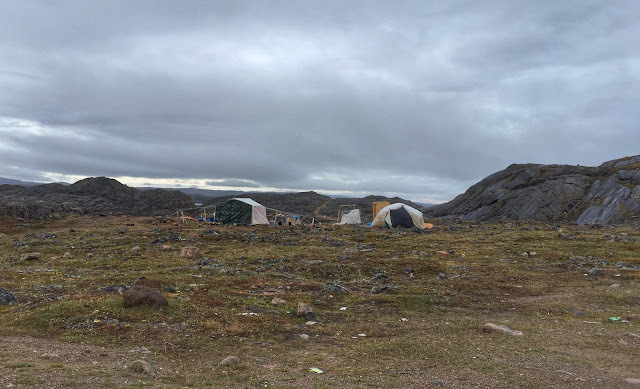 The capital of Nunavut, Iqaluit (pop. 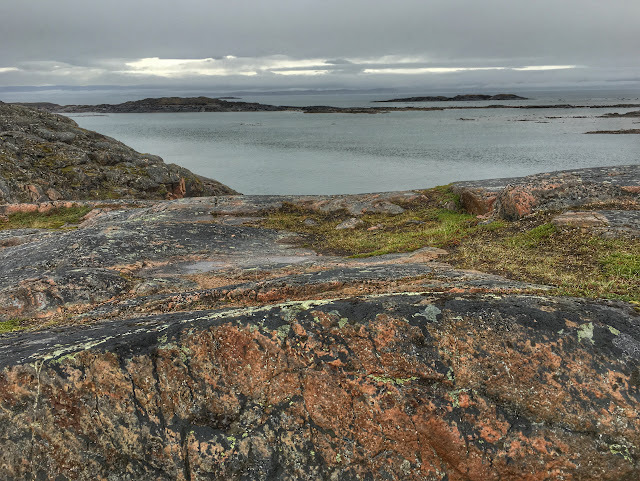 7,177) sits on the shore of Frobisher Bay. 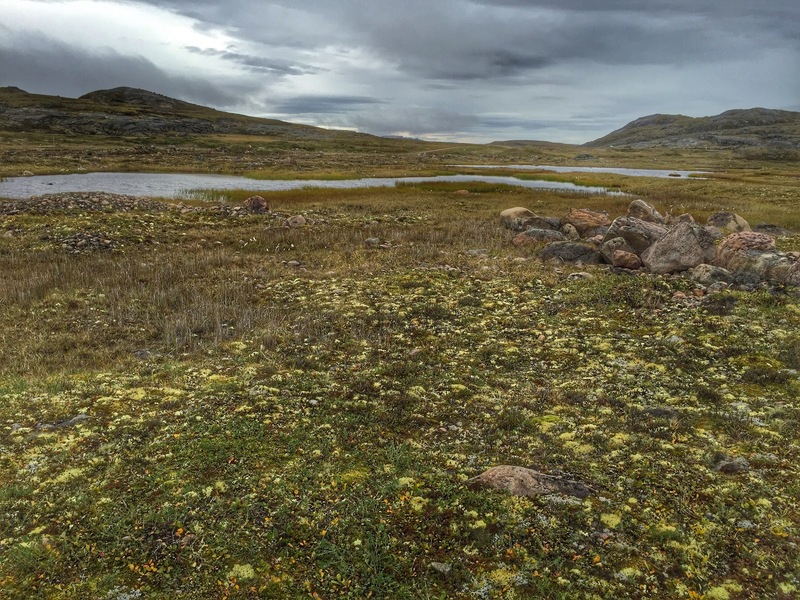 Set amid rocky rolling hills and tundra valleys, the entire town sits on a layer of permafrost. For this reason, virtually every building rests on pilings or stilts to prevent heat exchange from the house that would melt the permafrost. Stilts also eliminate the need for a level building site. 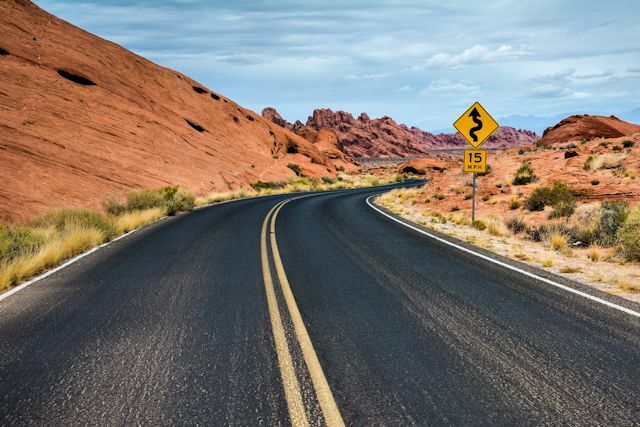 Another distinctive feature immediately noticeable is that most city streets are unpaved and unmarked with signage. According to locals, the first streets were asphalted in 2002 in preparation for a 2.5-hour visit from Queen Elizabeth. Since it's above the tree line and very little will grow here, Iqaluit also has no landscaping as we know it. Making up for all this drabness, many buildings and houses in Iqaluit are painted bright colors. When there are a limited number of roads leading only a short distance out of town, we seem to have the urge to try them all. So we drove on past the park to see where the road led. Where it led was a sprawling open-air dump with everything from household garbage to junked cars to plastic bottles and construction material piled in together. There appears to be only a half-hearted effort at keeping the trash covered with soil like a landfill, so every breeze spreads the rubbish hither and yon. Last year a fire burned in a mound of trash at the dump, pouring smoke and toxic fumes into the city's atmosphere for almost four months before officials were able to extinguish it. 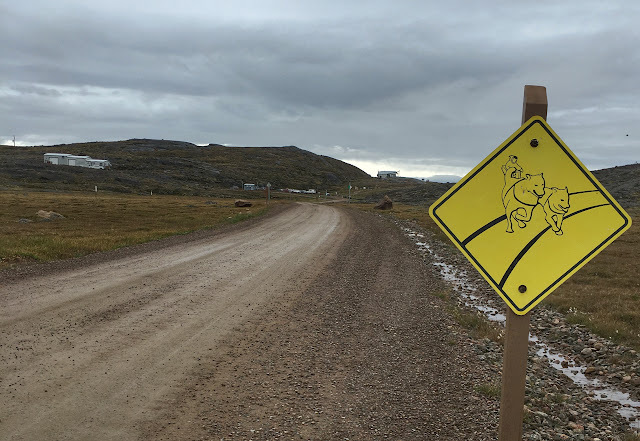 The road beyond the dump ended at Koojessee Inlet at the mouth of Frobisher Bay. So near to the dump, the area was litter strewn, spoiling what might have been a scenic view. Near the shore, rustic shacks dotted the landscape, presumably housing the city's homeless with materials scavenged from the dump. 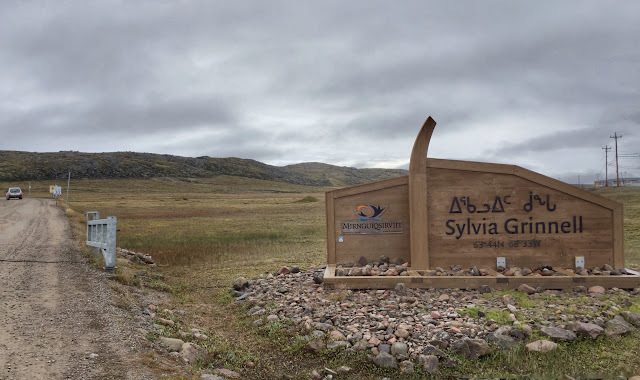 Finally we went back to Sylvia Grinnell Territorial Park. 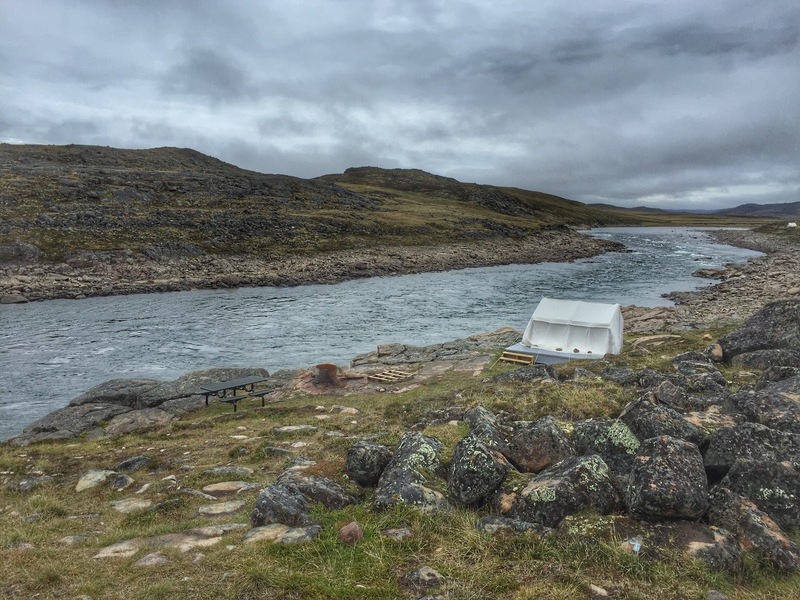 Straddling the river of the same name meandering through the tundra valley, this preservation area includes several easy hiking trails. The park takes its unlikely name from the river, which was dubbed by an American explorer to the Arctic to honor the daughter of one of the financial backers of his expedition. Wind was brisk and icy, so we didn't explore any trails today, but we did check out some double-walled white canvas tents set up near the river. These are owned and rented by a local outfitter for those who want to camp without hauling their gear. Tents are equipped with wooden platforms, cots, sleeping bags, and lanterns. But we didn't camp either, nor did we engage in any fishing though the river is said to be bountiful for landing a few Arctic char. Being without cell service, we're beginning to really appreciate how constantly we depend on our smart phones for the answers to questions. 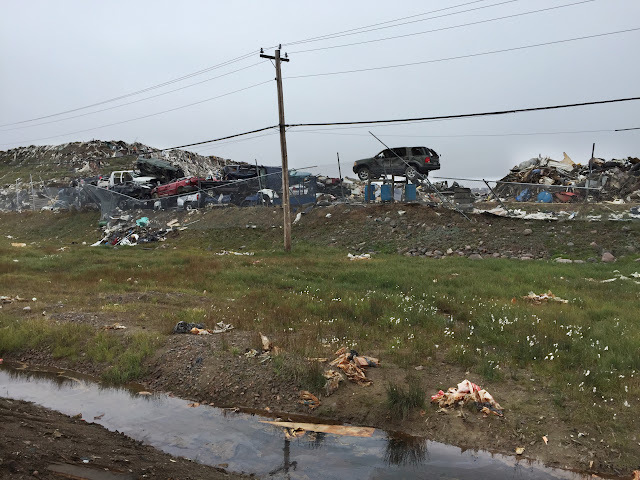 Some things we've wanted to search for today: Why is there so much litter in the city of Iqaluit? Who owns the tents in Sylvia Grinnell Park? Do the changing tide levels affect the river? Normally we would have found those answers on the fly. Now we just make note of the questions to research later. After lunch in our room at the hotel, we returned to the TI, hoping someone else would be on duty who would offer more assistance. When we arrived, there was our old buddy Josh, who pretty much ignored us as we walked around looking at brochures. Seeing no point in going through the same routine with him as yesterday, we were just about to leave when someone new and young and eager and friendly walked behind the desk. He hadn't even taken off his backpack before we began barraging him with questions. 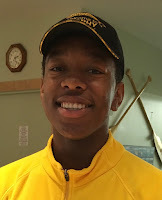 Only a high school junior, Kundai moved to Iqaluit with his parents six years ago, and he is an outstanding ambassador for the city. He was very upbeat, very positive, engaging, and eager to help us find ways to enjoy our time in the city. He told us about polar bears walking past his house last year and other anecdotes about his life in Iqaluit. He even introduced us to an audio tour of the city which the TI lends out on an iPod nano. Kundai's enthusiasm was contagious and we found ourselves eager to get started on the tour. As he suggested, we just plugged the iPod into the auxiliary jack of our rental car and we were off. Before we got too far, we noticed that forklifts were unloading a barge from the Sealift, so we detoured a bit to check it out. There we ran into another friendly resident. Bugsy was working security at the unloading site and wouldn't allow us to get close to the cargo area, but he was willing to talk to us. Quite articulate and knowledgeable about the operation, he admitted that he had spent 25 years in entertainment before moving to Iqaluit a few years ago. (No wonder he's so good with words!) We had read a bit about the sealift operation before coming here, but he filled in some blanks in our understanding. Sealift is the annual re-supply of fuel, construction materials, vehicles, and consumer goods to isolated communities. Even with the generous checked bag privilege on airlines serving the area, round trip air fare to the south can cost in excess of $2,000, so shipping by sealift offers greater capacity and lower cost. Sealift ships squeeze into the area as soon as the ice clears Frobisher and Hudson Bays, usually in July. Several lifts will be delivered between July and October before sea ice returns and cuts off this vital supply line. A favorite sight in Iqaluit. 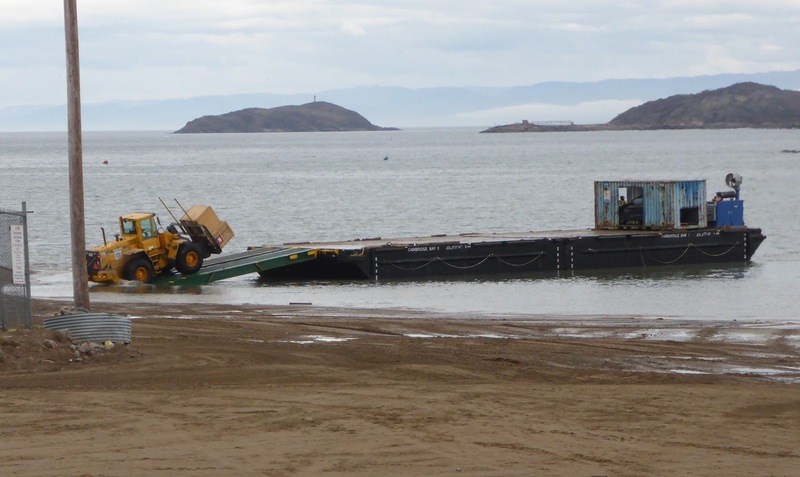 The sealift has arrived! 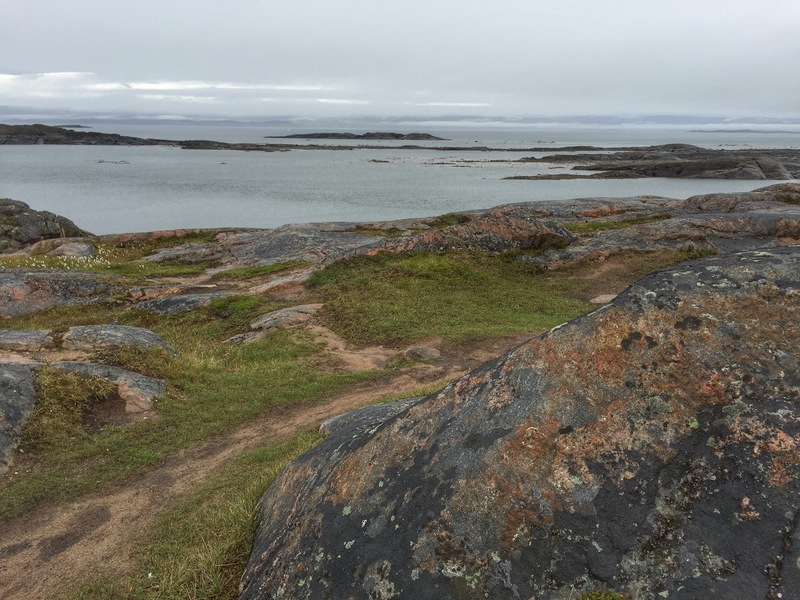 Because Frobisher Bay's water level varies as much as 40 feet with changing tides, Iqaluit has no port. The Sealift ship must anchor offshore, load cargo onto barges with cranes, and send tugboats to take the barges close to shore and ground them for unloading. Jumbo forklifts, which can go into the water to reach the barge, offload the cargo onto trucks for delivery. Since the small Arctic communities they serve lack the equipment for all this transfer, the sealift ship brings it all on board—barges, cranes, forklifts, and tugs. According to Bugsy, most of the cargo is shipped to businesses and government with less than five percent being destined to individual families. If they can afford to do so, some families try to buy a year's supply of basic goods when they visit family or friends down south and have it shipped on the sealift. 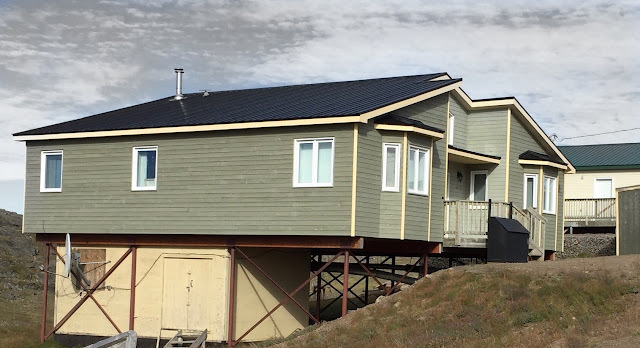 Thus some houses are equipped with a "sealift room." Finally we got back to the audio tour of the city and learned some things about Iqaluit. Discovery Hotel. Back in the days when transatlantic flights required a refueling stop and change of crew, Iqaluit was a regular stopover. PanAm Airline built what is now the Discovery Hotel in the 1950s as a barracks for crew who made transfers mid-flight. Today it has been transformed into a boutique hotel with what is reputed to be the best restaurant in town. Where the action is...if you have connections. Canadian Legion Hall is an important source of social activity in town and one of only a handful of places that sell alcohol. 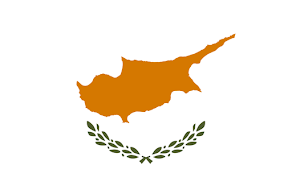 Dances are held weekly but guests are admitted only if accompanied by a member. S'More to love with this school. Nakasuk Elementary School. 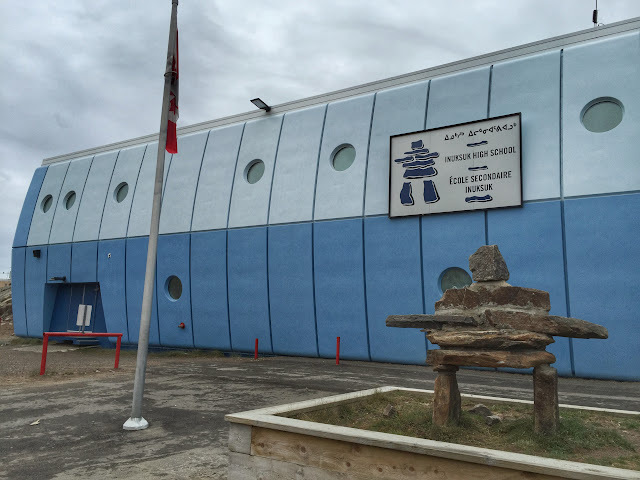 One of three elementary schools in Iqaluit, this structure that looks like a giant marshmallow sitting on a mound of earth was built at the height of the oil crisis in the 1970s. 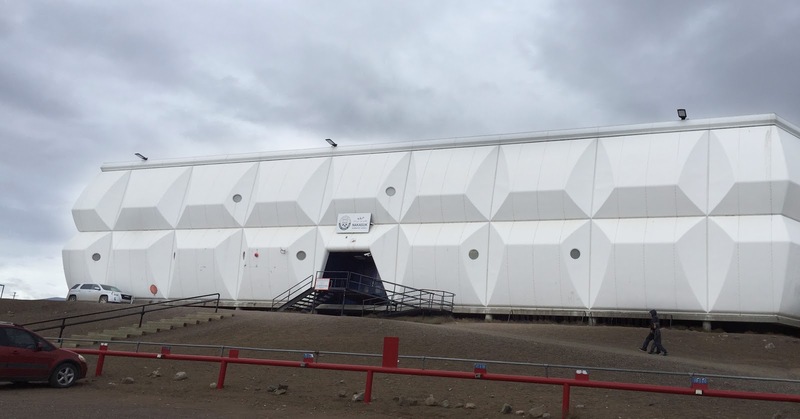 With energy conservation the primary goal, construction was done with fiberglass modules built on site and a minimum number of windows to cut down on heating costs. Inuksuk High School. Built in the same era as the elementary school with the same energy crisis in mind, but the high school did get a bit of color. Bet you can't guess what this church is usually called? Yeah, you got it. The igloo church. St. Jude's Anglican Cathedral. 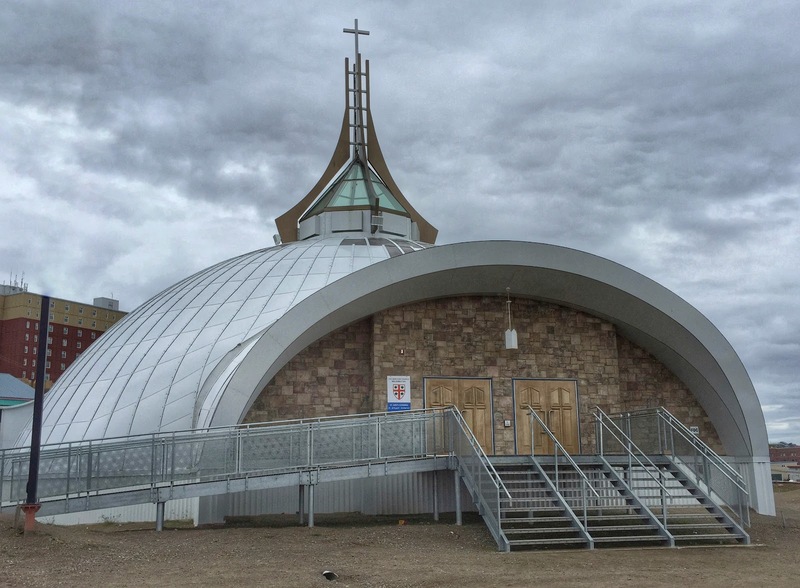 This igloo-shaped church was completed in 2012 as a replacement for the previous church that burned. 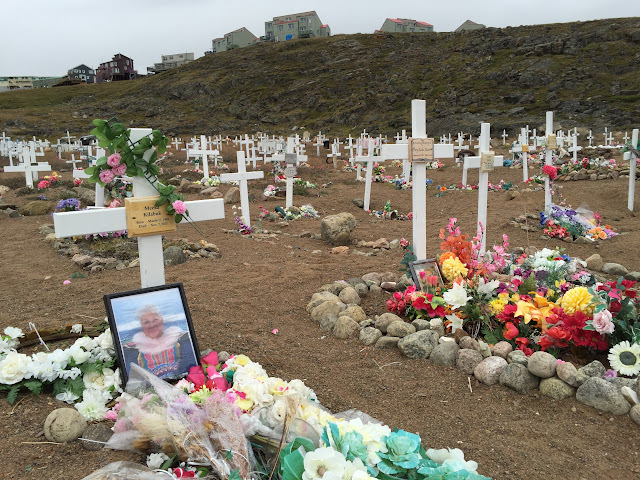 Anglican missionaries came to the area in the early 1900s and significant numbers of Inuit converted to Christianity. The congregation has a sizable Inuit membership. There was much more to the tour and it was quite interesting but too long to include here. 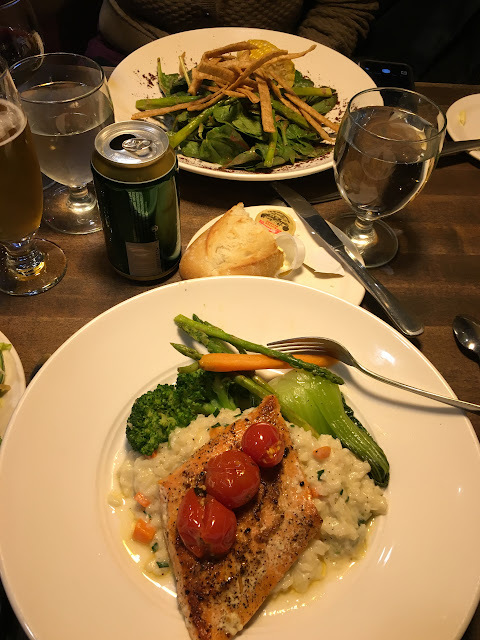 After we finished, we went to the Frobisher Inn and had dinner at their Gallery restaurant so Ken could try an Arctic char (similar to salmon), which he declared quite good, as was my asparagus and spinach salad. 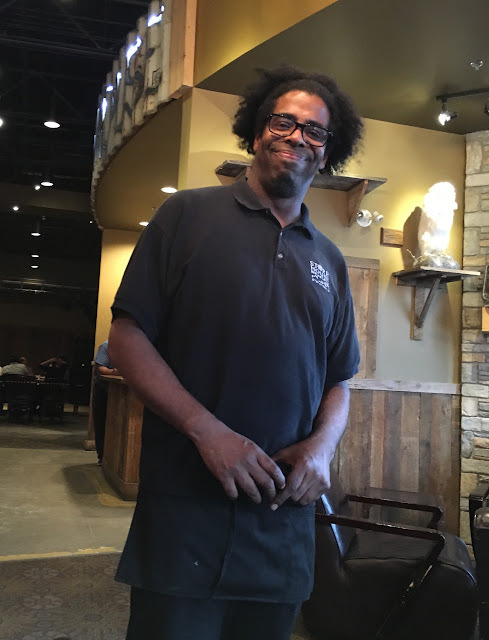 Afterward we stopped in the Store House Bar and Grill on the property and hooked up with Bugsy, who was waiting tables and tending bar. Then we called it a day, planning to plant at least one letterbox tomorrow and visit nearby Apex and maybe even strike out on the Road to Nowhere. Help Wanted: Hers a listing of some of the jobs advertised in this week's edition of the Nunatsiaq News. Preference in hiring to Inuit for all government jobs. You don't see this sign every day in Georgia. Still a little tundra flora in bloom. At the local cemetery, plain crosses marked each grave and most were lovingly decorated. 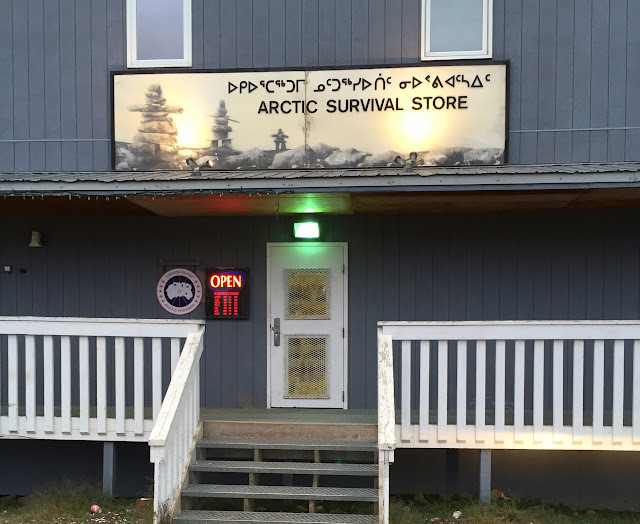 This place must have everything you might need.